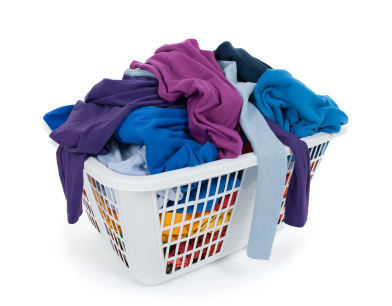 Dried washing is not processed or put away The most common of bottlenecks. While folding and ironing are optional, putting away is the key to laundry flowing freely. Decide where Ready to Wear clothes will live. Is there enough space for all your clean laundry to live? If not, you either have too much laundry or not enough space. Once all those bottlenecks are clear, the cycle should flow easily, as long as enough time and energy is set aside for this essential task. And we sure have come a long way from beating our washing on a rock, hand washing, or even using a copper and mangle. If laundry still gets you down, or stuck, there is help at hand. Creating Order from Chaos can help. This entry was posted on November 5, 2012 at 3:16 pm and is filed under For Families, For Hoarders, Organisation, Wardrobe. You can follow any responses to this entry through the RSS 2.0 feed. You can leave a response, or trackback from your own site. Lol! My laundry is right at my front door – When I am time poor, it’s not unusual for visitors lately to have to hurdle my piles – four kids and a construction worker hubby 😉 the washing is the first thing that falls off my ‘to do’ list.